My friend shyam has excessive money and he is in search of short term investment option. He want to get quick return. Do you have excessive money? Do you want to invest this money for short term? If yes you are at correct place today we will be discussing about 10 best short term investment options. Short term investment option is required when we have excessive money and there is pressing expense expected in near future. Expense could be anything but investment in good short term investment would defiantly increase value of money. Fixed deposit is most popular investment option. FD is available with different tenures, starting from 7 days to 5 years. Interest rate varies of FD varies from 7% to 9.25%. Saving bank account is the safe and very good short term investment option. You must be thinking that saving bank will provide less interest 4% only but today you can earn up to 7% interest by placing your money in saving bank. Bank offering higher interest on saving bank account are Yes Bank – 7%, Kotak Bank – 6%. Auto sweep provides combine benefit of saving bank account and fixed deposit. Auto sweep account is very good short term investment option. Auto sweep account automatically convert surplus amount of your account in fixed deposit. In some cases penalty is applicable if FD under auto sweep account is broken before 1 year. Fixed maturity plan is closed ended debt scheme. FMP as name suggest it has fixed maturity date and fixed return. FMP is low risk high return investment option. Investment in FMP also provide attractive tax benefits. Liquid fund is mutual fund which invests in money market instruments like term deposit, certificate of deposits, treasury bills etc. You can liquidate money from mutual fund in 24 hours. Some liquid funds providing higher returns are HDFC Liquid fund -9.7%, ICICI Prudential Liquid fund -9.7%, Birla SL cash plus – 9.8% (Last year return). 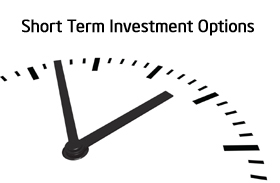 Ultra short term funds invest in fixed income instrument with short term maturities. Ultra short term funds provide good protection against interest rate risk. Some Good ultra short term investment funds are ICICI Prudential Ultra short term plan -9.27%, HDFC Ultra Short term Bond Fund – 9.34% (Last year return). Certificate of Deposit is usually sold by bank. Bank gives you guarantee of returning bank principal amount with interest. Premature withdrawal is not allowed in this option. Investment in stock market is risky affair, but it is very good investment option for hungry investor. In short term you can gain good profit but sometime you can end up by making loss also. Mutual funds is also one of the risky investment option for short term. If your investment horizon is for 1 year than you can invest in good blue chip large cap oriented fund to get good return. Yellow shining gold could be another option for short term investment. As we know in recent past gold has given very good returns. Instead of investing in physical gold you should invest in Gold ETF. Gold ETF investment provides good liquidity. Before investing in any short term investment option given above make sure you understand investment option in terms of associated risk and expected returns. Understand terms and condition thoroughly before making investment. Do share your experience of investing your money in above short term investment options. Fixed deposits (FD) are one of the best ideal investment tools in India. Fixeddepositbazaar provides you better save money plans regards Fixed Deposit,Bonds and Debentures etc.